I’m unable to write a single word. However, the predicament does not unnerve me, for I know for sure that anyone in my position would feel the same helplessness. 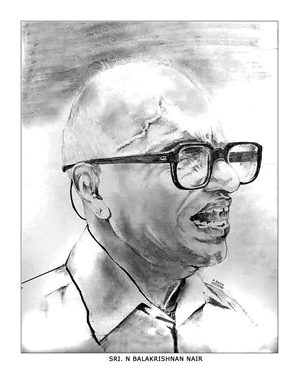 I had taken on the responsibility of penning a few words on one of the legends that had walked the hallowed grounds of our alma mater, Shri N Balakrishnan Nair Sir. Having volunteered to do that, I really am at a loss as to how to proceed. My worry; would my words be even remotely befitting that great teacher ? I hope it does. There are times when you thank your stars for having taken a decision. One time was such whereupon I decided to route my trip to Satara for attending the All Sainik School Principals’ Conference, through Bangalore. My mission, to spend some time with a teacher, a guru next to God, my NBN sir. I was quite reluctant to go empty-handed to meet him and so rang up his son, Shri Pradeep B for advice as to what would make him happy. The response was exactly on expected lines. He adviced me against any such misadventure, but asked me to be prepared to spent at least half an hour with him, for that’s all that he desired from his cadets. Since I was unable to accept the first part of his advice, I spent some time contemplating as to what could be taken without offending the Teacher. Late into the night before my travel, it struck me. I hurriedly got up, searched the net and located a photo of sir and started making a pencil sketch of him. Once finished, I silently thanked God Almighty for giving me the idea and my art teacher, late Shri KB Rao for giving me the wherewithal to execute it. When I reached his house, he was waiting for me, having been informed by Pradeep sir. I was totally taken aback by the skinny and puny figure who greeted me. It was almost five years since I met him last and it seemed the passing of Ma’am had had a telling effect on his health. He was visibly happy in getting reconnected to the school for the umpteenth time. He made me sit and excused himself to go attend to his younger brother who was bedridden and a patient of dementia. Once again his greatness was accentuated by his act of adopting his brother, a bachelor, and providing him everything possible. As he returned lit up with nobleness and his ever radiant smile, I presented him the portrait with much trepidation. To avoid a situation, I had not gift wrapped it and whatever resistance that would’ve risen up in him seemed to wilt away as he glanced at the portrait. I humbly conveyed that it was sketched by me and saw his eyes glisten and moist over. He hugged the portrait and cried which made me break down too. He said “Sir, this is a great gift for an old man to receive”. Since the time I reached his house, he had addressed me as ‘Sir’ which very evidently placed me in a painful situation. “Sir, I’m 2053 of the 1990 batch” I said, believing him to be mistaking me for someone else. “I know” he said, “but now you are the Principal of my school. I should not get the wrath of Gods for addressing the head of my institution which gave me everything in life by his first name”. For the first time, I hated the posting order which miraculously brought me back to my alma mater to serve her. “But Sir, I am what I am because of the very same alma mater and a set of beautiful teachers like you. Isn’t it blasphemous for a teacher to address his student thus?” He seemed unfazed by my logic. That’s NBN sir. If he is convinced of something, he wouldn’t budge, come hell or high water. “Sir, Dr APJ Abdul Kalam was also taught by many teachers. He became the President of India. Do you mean to say that his teachers should call him by name and take similar liberties?” I didn’t have an answer. However, seeing my terrible predicament and to my total relief, for the rest of our meeting, he interacted without addressing me. 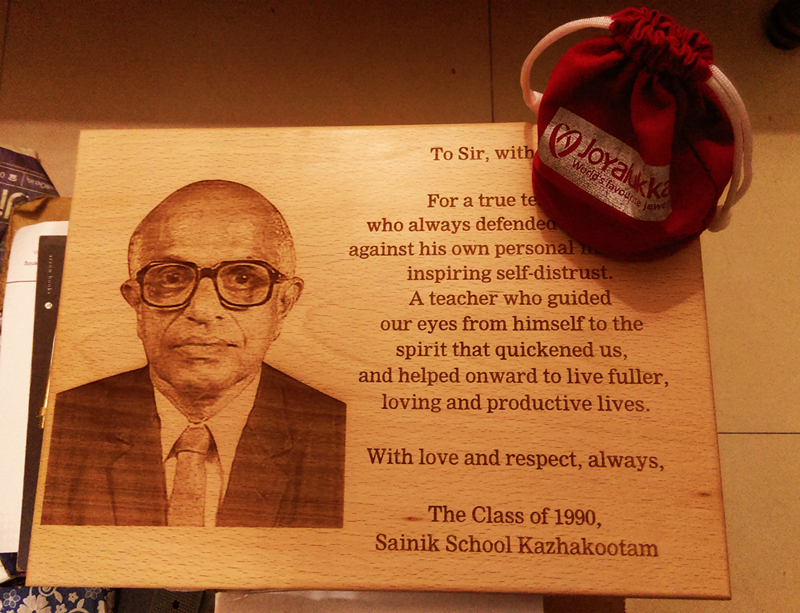 Sir spoke at length about the initial days of our school and how he came out to be a teacher here. It was so that he was a research fellow at Roorkee, when he was among a few to be handpicked by, as per Sir, the ferocious dictator of sorts, the then Defence Minister, Shri VKK Menon. He reached Delhi as ordered and moved to the Defence Minister’s office. There were a few others and he was send in by the PA on his turn. He was asked by the RM to immediately move to Pangode to which he conveyed his inability due to his research fellowship. Not another word was spoken and he was sent out. Once outside, he was quizzed by the Keralite PA as to what transpired and hearing his response, the good old man appeared shell-shocked and advised him to move back immediately to the RM and apologise and accept the offer. A terrified NBN sir moved back in and somehow conveyed his apology and acceptance whereupon, the RM just grunted, nodded and tore a piece of paper on which he was scribbling something. He gave the torn sheet to him and asked him to give it to his PA. The PA took one look at the sheet and looked up to say that it was a letter to his Roorkee University to cancel his fellowship. Mrs Pradeep brought in tea and snacks at the very same time as my classmate, Roll number 2012, Gopinath G joined us. The conversation then revolved around very many senior OBs, their families and positions etc. Sir brought out old albums and all three of us were immersed in nostalgia till it was time for Gopi to leave for his office. 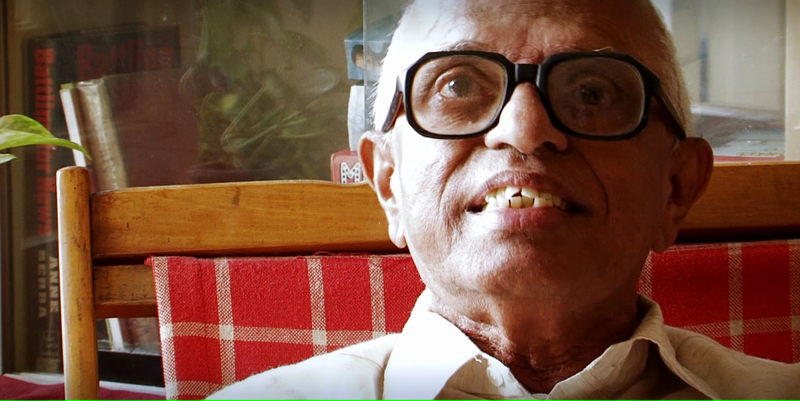 Once Gopi left, Sir was pensive for a while, as if recollecting and structuring certain thoughts in his mind. When he spoke, his words were clear. He said that he was waiting for an opportunity to disclose certain things for long and was happy that he could do so to someone who is in a position at the alma mater. He mentioned a particular Master, again a legend in his own way and about their strained relations based on some misunderstanding that the other nurtured. He said that he always considered that master as his own brother and would remain indebted to him for ever for the kindness shown to him during the delivery of his son as well as during a sensitive medical episode of his wife. On both occasions, that master and his lady had gone out of the way to look after him and take care of his family’s needs. He recollected how his family was looked after yet another time by that good soul when he was refused to be absolved from a school duty by the then Principal which mandated him to be away for a long period of time. It was a time of extreme strain since his wife was not keeping too well. Due to some silly misunderstandings, the relation strained and he could never clear those misconceptions till date. He cried again stating that it was the biggest mistake in his life for not clearing the air when he could while at school. I consider myself as lacking in the ability to effectively console someone in mental pain and here too was stuck for words. However, he recovered immediately and asked me to sit near him and show and explain the school magazine that I had carried with me to hand over. He evinced a keen interest in the happenings of the school which were reflected in the magazine and gaped with child-like wonder at the administrative developments. Once done, he again moved into his brother’s room to look after him and after some time called me inside. He had opened a wall almirah wherein he had stacked handmade albums and gift boxes, a viable time pass and a method to keep his brain active as per him. He insisted I pick out my own memoirs not just for me, but my wife and children too. The two boxes, one big and one small, still adorn my house as precious gifts. It was almost lunch time and I had a train to catch. I had already spend about five hours with Sir. Though he insisted that I should have lunch, I excused myself and took his leave. 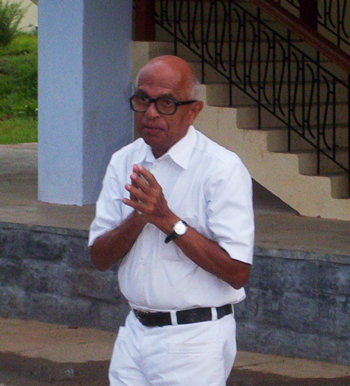 I was in school as a Class XII student when Sir retired from service in October 1989. He continued to stay on in campus, paying rent for his accommodation from his pension and saw our batch through our board exam. Dedication unfathomable was what all of us perceived it as till now. With his parting words, another viewpoint emerges. As a drowning man desperately tries to stay afloat and retain life, here was a soul which wanted it’s body to stay on in the campus for ever and ever, and the five odd months of voluntary work was an effort to appease that need, even partially. How can someone love anyone, that too an institution, so much? On my ride back to the station, his kind face and soft voice kept me company. It shall remain so forever, as a beacon light. Very many anecdotes have been brought forth by his disciples at different forums at different times. For most, he was an epitome of everything that’s noble in this world. I may not be able to emulate his goodness, but I can be sure that he would be watching over me from somewhere. Before I wind off, let me endorse his advice to the present set of cadets. He said and I quote, “Dear cadets, you are in a great institution. Do realise it’s true worth while you are it’s direct beneficiaries and not once you leave it’s warm confines. It may be too late”. I unquote. May God Almighty keep his soul at peace and in the school as he always desired.